I’ve said it before and I will most certainly say it again: Amanda Kaffka is the height of fashion. Not only is she fashionable in her knitwear (as I will explore further shortly) but she is also pretty fashionable in her attire in general. She’s that girl that puts together the oddest cocktail of clothing and looks completely cutting edge. I may never aquire this skill but I can certainly appreciate it! Her latest trendy knit is The Slouchy and she has even knit it in one of my very favorite yarns, Blue Sky Alpacas Worsted Hand dyes. 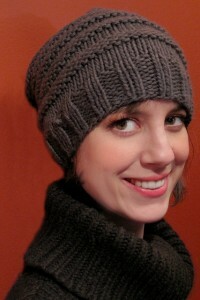 Amanda has also knit up a cute jazzy version of this hat in the Dream in Color Starry. Starry is a cool yarn, I’ve knit a pair of socks in it myself, and it has the same beautiful colours as DIC Classy but with a hint of silver sparkles. How did she manage to use a sock weight yarn for a worsted weight hat? She held three strands together! 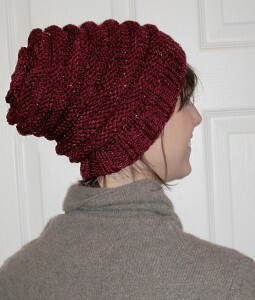 The nice thing about using the Starry is that she only needed one skein, always good in my books. This entry was posted on Friday, March 4th, 2011 at 12:16 pm	and is filed under Uncategorized. You can follow any responses to this entry through the RSS 2.0 feed. Both comments and pings are currently closed.